Prime Minister Erdogan labels latest violence in Urumqi as "genocide"
ISTANBUL, Turkey (CNN) -- Turkey's prime minister continued his outspoken criticism of China's crackdown on ethnic Uyghurs on Saturday. 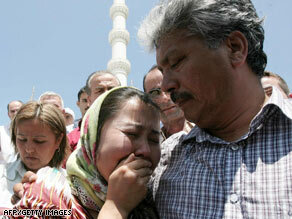 A Uyghur student cries as Turks pray on Friday in Ankara, Turkey, for people who died in protests in Urumqi, China. In remarks published by the official Anatolian Agency, Recep Tayyip Erdogan denouncing what he called "savagery" and called on the Chinese government to "give up efforts to assimilate" the country's Uyghur minority. On Friday, Erdogan went a step further, announcing to journalists upon his return to Ankara from the Group of Eight summit in Italy that "the incidents in China are a genocide. There's no point in interpreting this otherwise." Many Turks view the Uyghurs of Central Asia as fellow Turkic, Muslim brothers. At least 184 people died in last weekend's violent protests in Urumqi, in China's far-west Xinjiang region, according to Chinese state-run media. The violent demonstrations also left more than 1,000 injured in the capital, according to government figures. Heavily armed troops remain on the streets of Urumqi and curfews are in effect. The violence is a result of ethnic tensions between the Uyghurs, who are predominantly Muslim, and members of China's Han majority. Hundreds of Han Chinese were on the streets of Urumqi last Tuesday, holding sticks and pipes and calling for severe punishment of the Uyghurs, who they say committed serious crimes. Several hundred Turkish and Uyghur demonstrators gathered during the past week to protest outside the Chinese embassy in Ankara. In another comment widely reported in the Turkish press, Erdogan announced he would be willing to approve a visa for Rebiya Kadeer, an exiled Uyghur activist currently residing in the United States. Kadeer issued a response on Saturday, which was distributed to CNN from her publisher and publicist, Kenneth Kales. "I am grateful to Prime Minister Erdogan for his comment that Turkey will grant me a visa. I look forward to traveling to Turkey as soon as possible. The Uyghur and the Turkish people share close cultural and linguistic roots. "The Uyghurs and Turks consider themselves as the same people. Uyghurs cherish our common language, customs, and spirit of freedom. We embrace the opportunity to meet with our Turkish cousins." However, Kadeer was "not entitled to represent the Uyghur people," a former Xinjiang official said, according to China's state-run media. Ismail Amat, an ethnic Uyghur who headed China's Xinjiang regional government, was quoted by the Xinhua news agency as calling Kadeer "scum."